Harcourts New Zealand in conjunction with the Harcourts Foundation have formed a long-term partnership with Plunket New Zealand. Plunket is the largest provider of free support services for the development, health and wellbeing of children under five in New Zealand and see approximately 85- 90% of new-borns in New Zealand each year. Being New Zealand’s largest and most trusted real estate brand, Harcourts offers Plunket the base and network to build and support communities at scale; which was one of the key factors that brought the partners together. In addition to the national brand partnership, through a network of 194 offices across New Zealand, there is a huge opportunity for local Harcourts teams and the Harcourts Foundation to work with Plunket centres to give back to their communities. Plunket Chief Executive Amanda Malu says Plunket’s partnership with Harcourts provides a real opportunity to leverage both organisation’s strong networks throughout New Zealand to benefit communities. Chris Kennedy, Chief Executive Harcourts Group Ltd says, ‘I am honoured to be able to partner with Plunket knowing it is committed to giving every New Zealand child the best possible start in life. We have seen many great outcomes for New Zealanders through our work with Hospice New Zealand who we also continue to support. It will be great to see the positive impact of these partnerships which will enable donations to be made to Plunket and Hospice New Zealand through the Harcourts Foundation’. 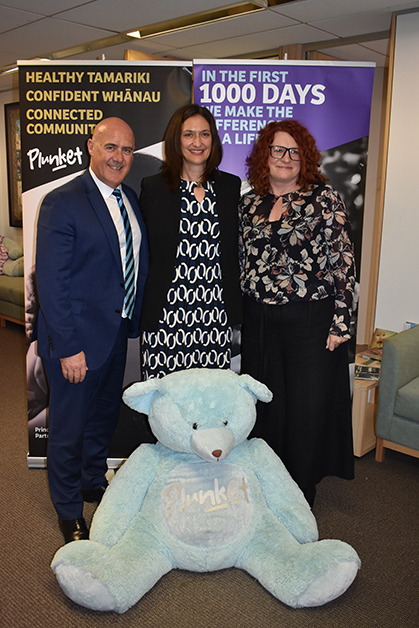 Harcourts Foundation ambassador Emma Revell says Harcourts teams from around the country are excited to work with Plunket and Hospice New Zealand. ‘We have found that local connection is one of the most important ways to succeed; as Harcourts’ teams see the impact of their contributions first-hand’. Under the partnership agreement, Plunket will provide Harcourts with the opportunity to market some of its properties, where agreement for their sale has been reached. The first property to be marketed under the partnership is located in Kohimarama, Auckland.